Just in: 5 APC members die in Kwara auto-accident - NAIRAFAME | Best Entertainment Platform. Five members of the All Progressives Congress (APC) were confirmed dead in a ghastly motor accident a few meters to Oke-Onigbin, a Kwara suburb, on the Omu-Aran-Ilorin highway on Sunday. 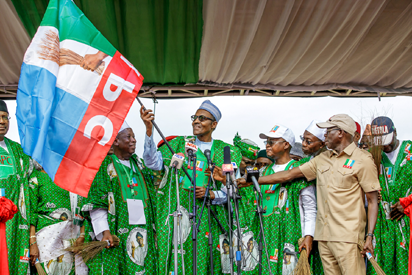 Newsmen gathered that the APC members and some party executives of Irepodun Local Government Area of the state were on their way to Oro for a rally. Newsmen gathered that the rally in Oro, the hometown of the Minister of Information and Culture, Alhaji Lai Mohammed, was meant to celebrate the outcome of Saturday’s bye-election which the party’s candidate, Raheem Olawuyi. Azeez told newsmen that the jeep had overtaken a trailer while on top speed before the head-on-collision with the cars conveying the party members. Journalist, who visited the hospitals on Monday, reports that the party ’s stalwarts were seen making frantic efforts to receive the corpse of the victims for burial at their respective communities. Mr Tyia Asagun, an official of the Federal Road Safety Commission, Omu-Aran Unit Command, who claimed to have coordinated the accident rescue efforts, told newsmen that the cause of the accident was still being investigated.